These eco-friendly pouches are the perfect accessory for carrying your gadgets, money, keys, phone, lipstick - all those small loose items that always get lost in the bottom of your bag! 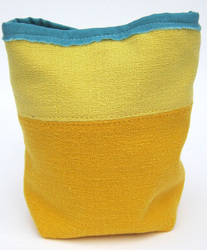 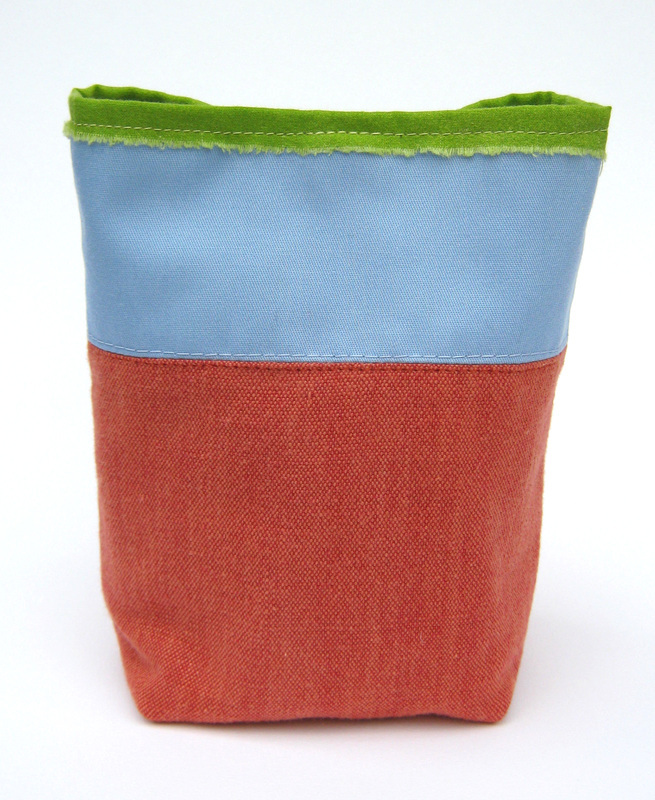 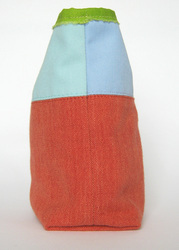 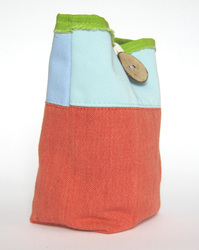 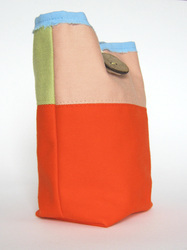 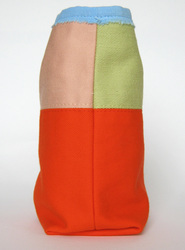 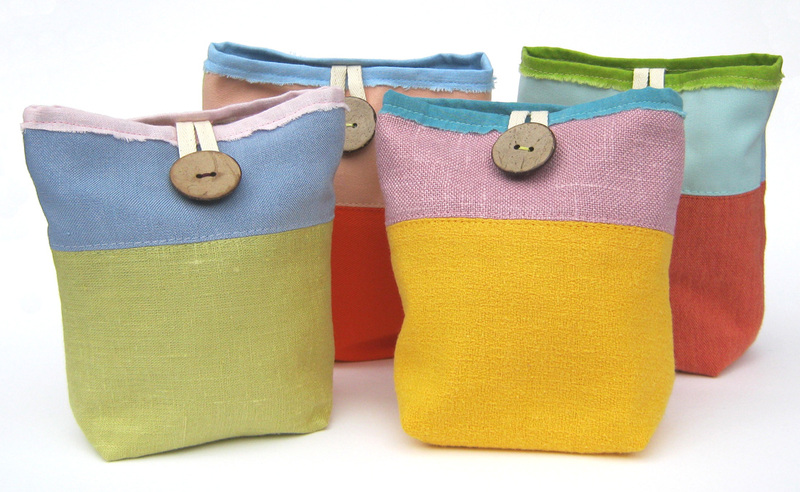 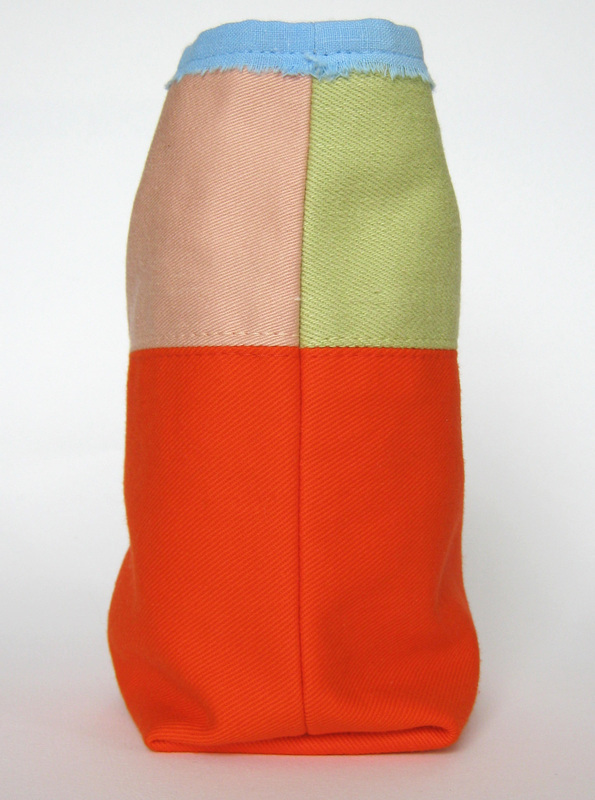 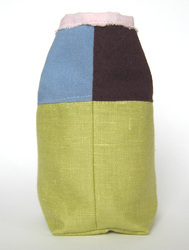 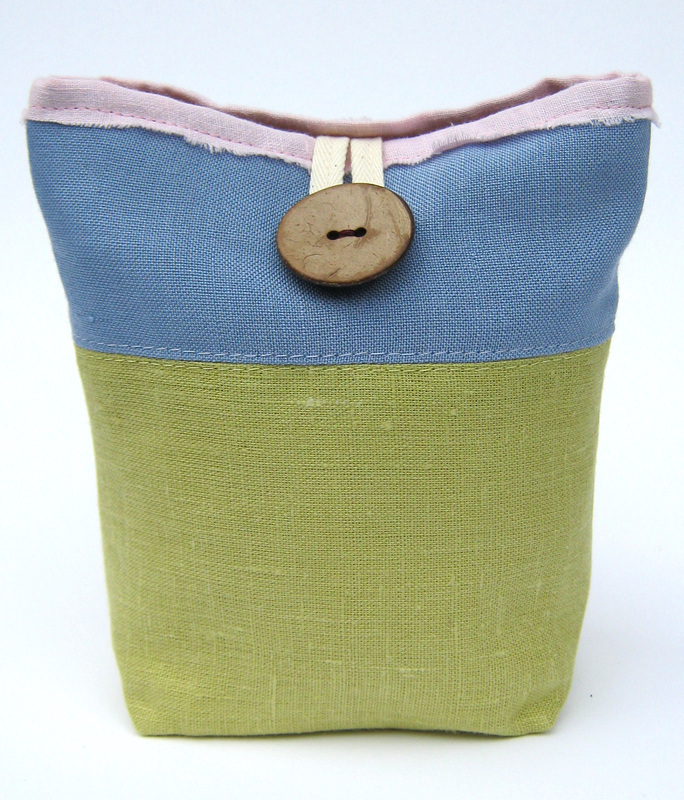 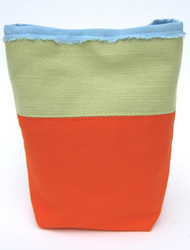 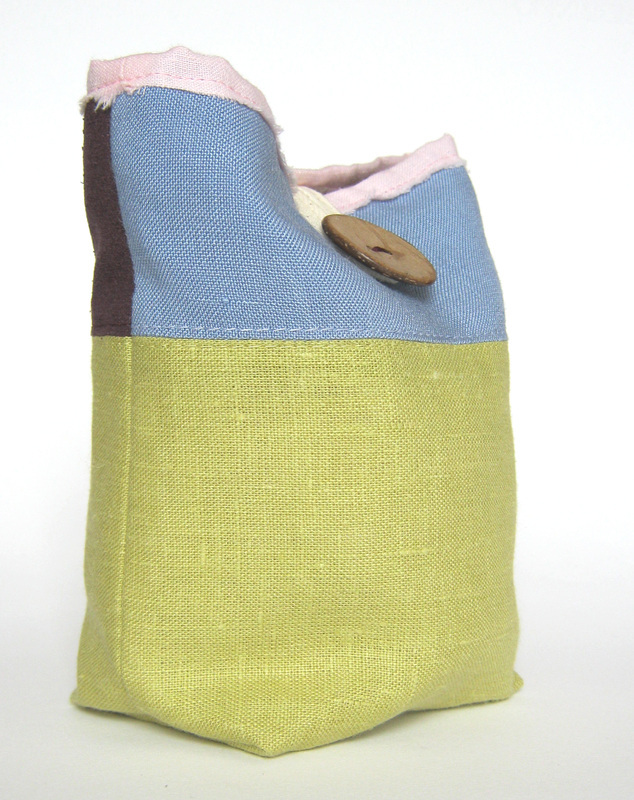 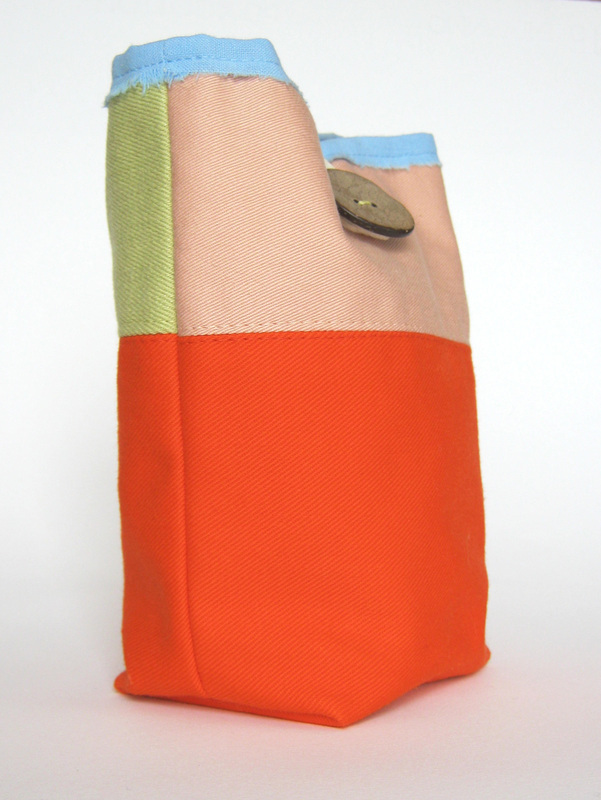 Your pouch will arrive in eco-friendly / upcycled packaging. 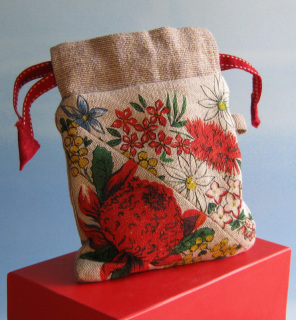 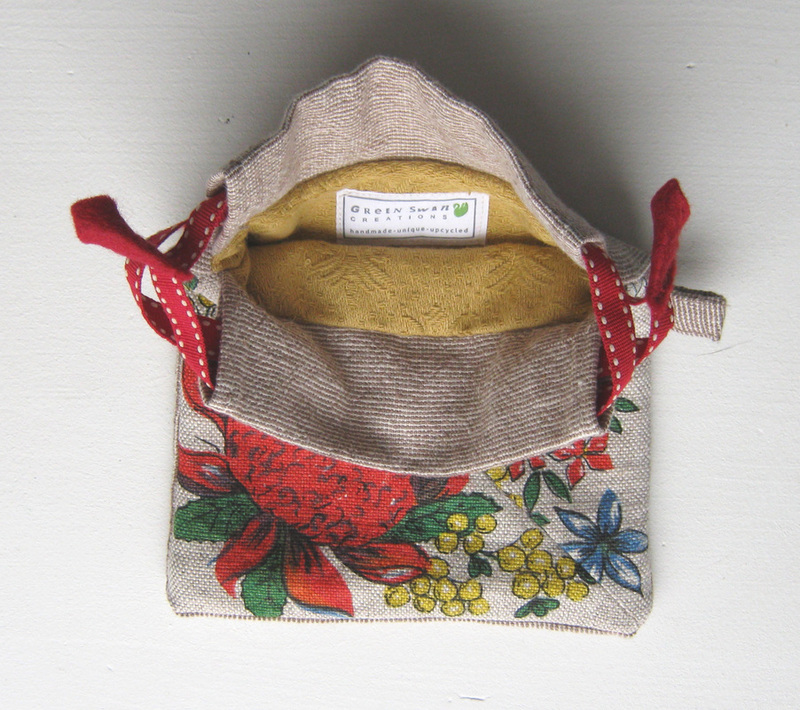 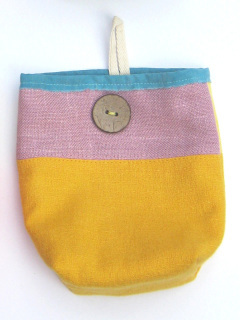 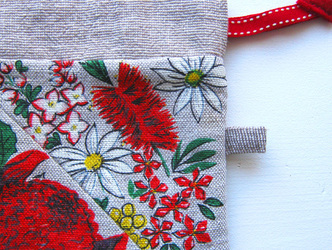 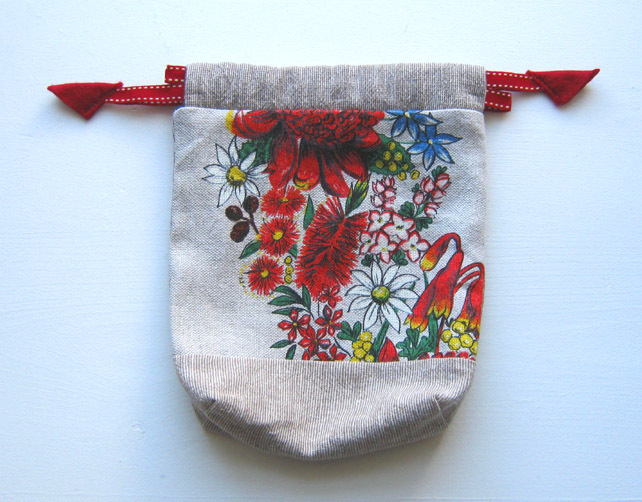 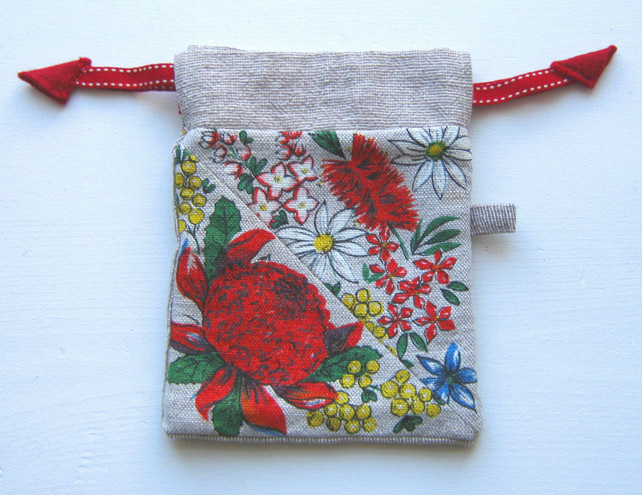 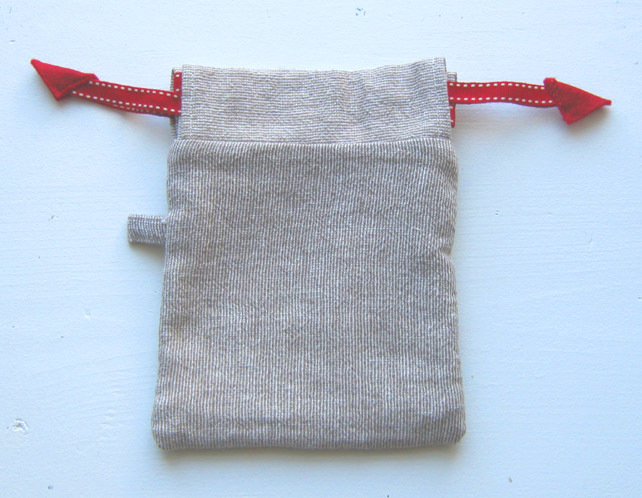 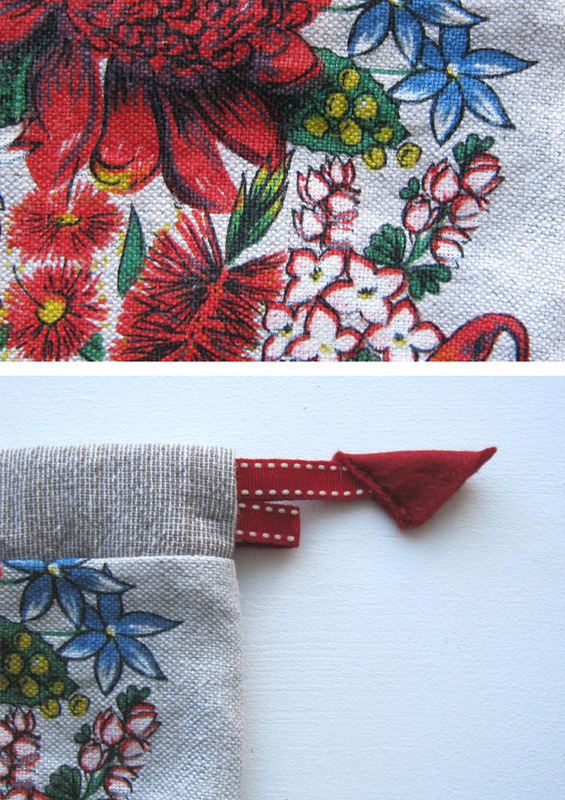 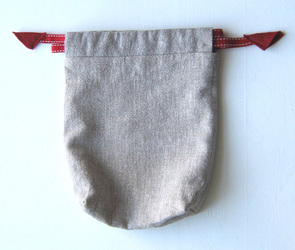 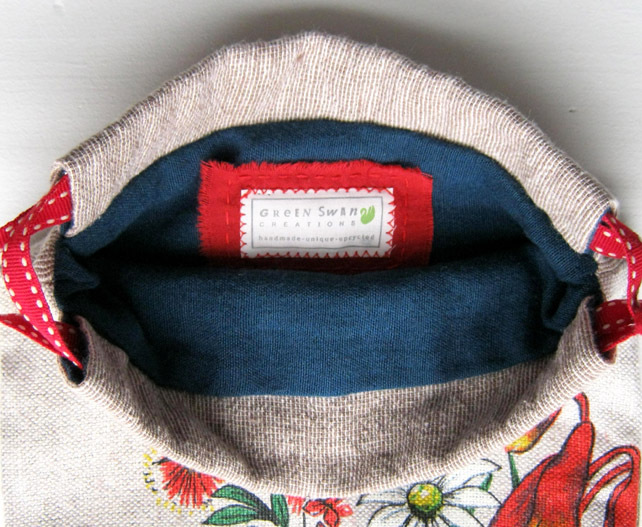 This drawstring pouch is handmade from upcycled vintage souvenir linen union - each pouch features drawstring ribbons with felt ends, a plain weave oatmeal linen union back and is lined with contrast fabric. The smaller pouch has a loop for your key ring. 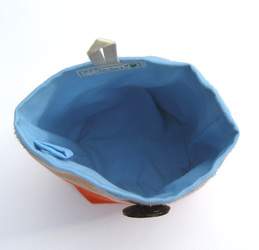 The large pouch has a boxy base. A contemporary patchwork design with a focus on sustainability; a unique product & gift for those who want to reduce their ecological footprint without sacrificing style. Patchwork pouch - from vintage Australian souvenir - with naples yellow vintage jacquard lining. 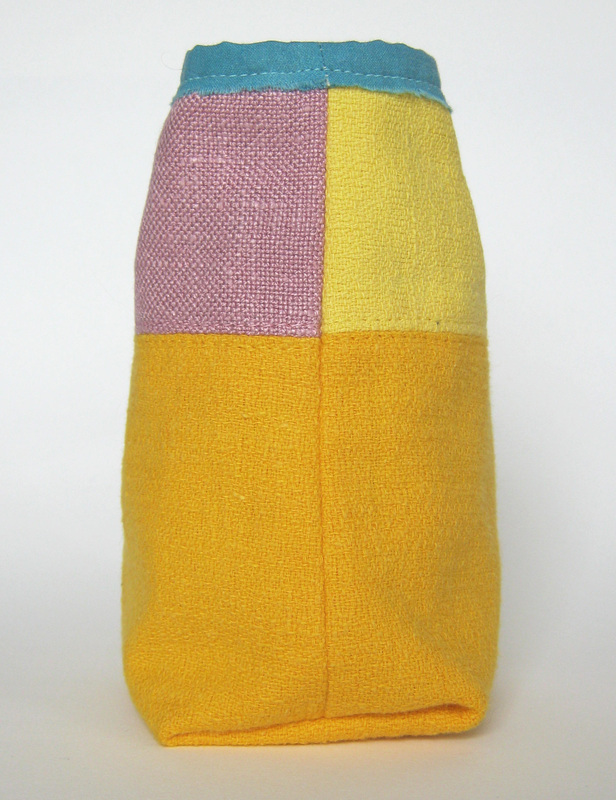 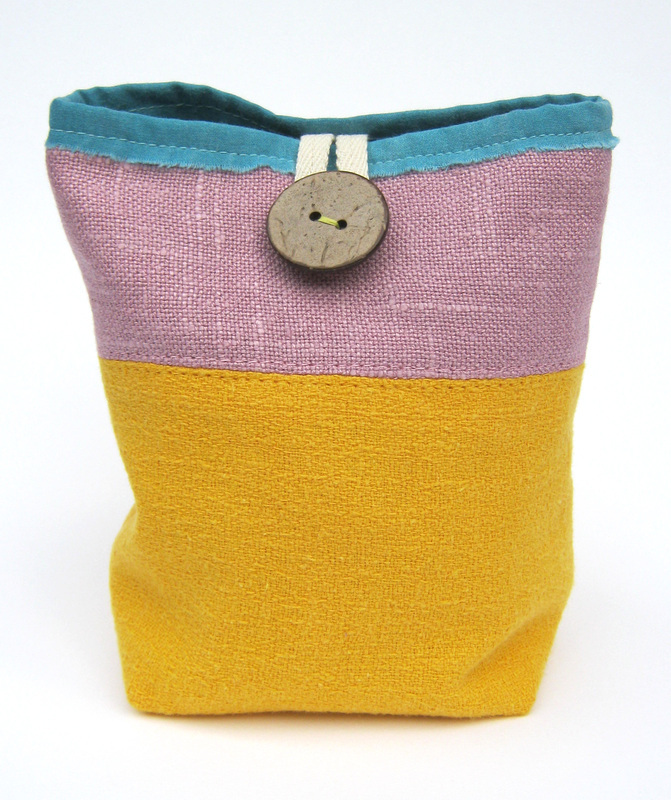 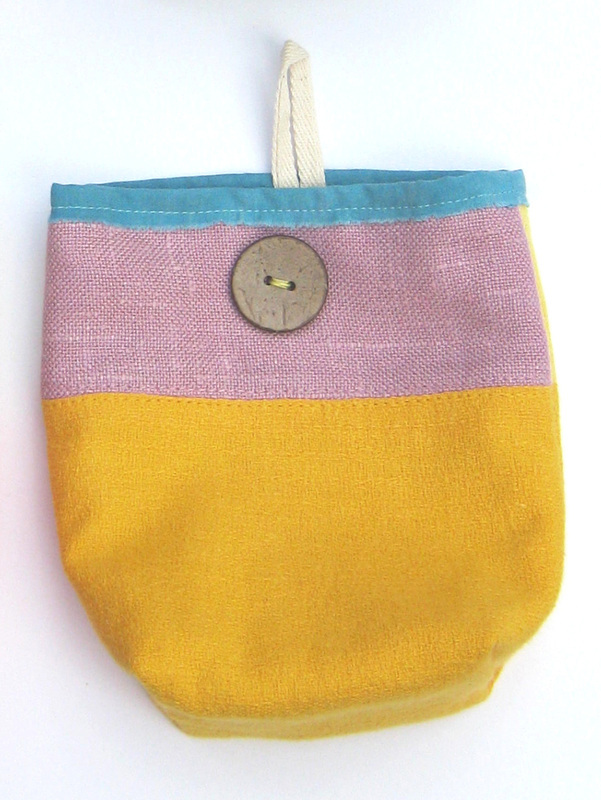 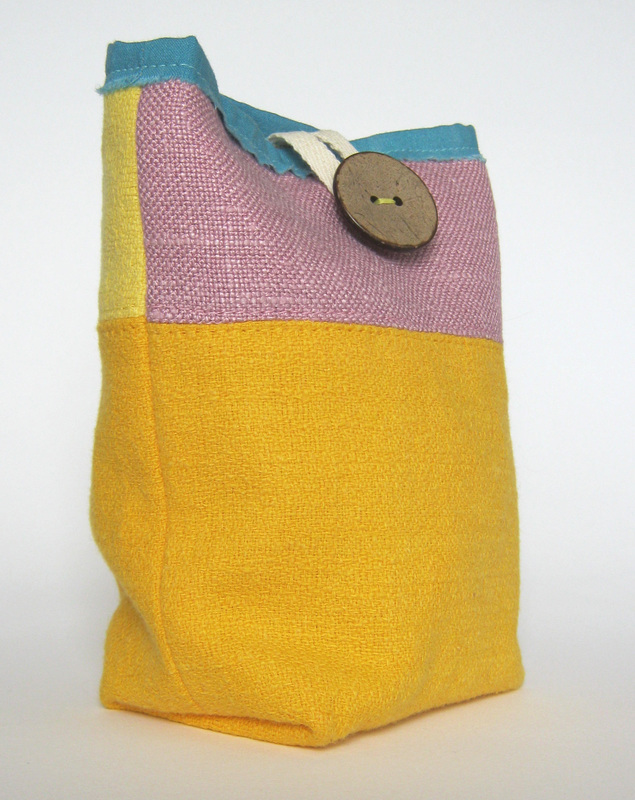 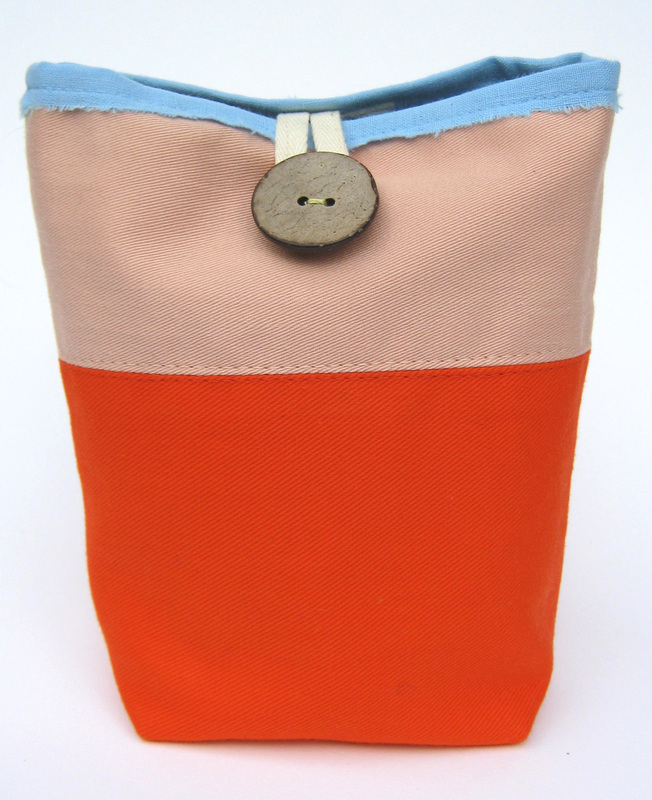 H 7 1/4" x W 5 1/2"
Colourful vintage pouch - from an Australian souvenir - with oxford blue linen/viscose/cotton lining. 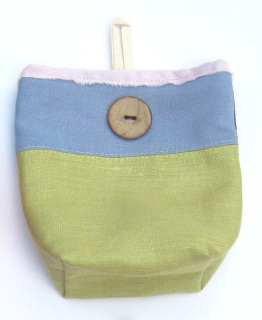 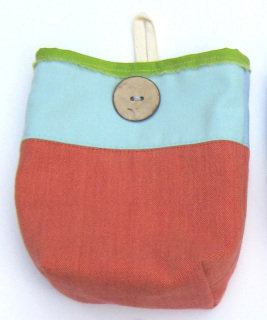 H 8 1/2" x W 7 1/2" x 2"
The button pouch is handmade with upcycled fabrics - each pouch features topstitch detailing and a coconut shell button with unbleached cotton twill loop fastening. 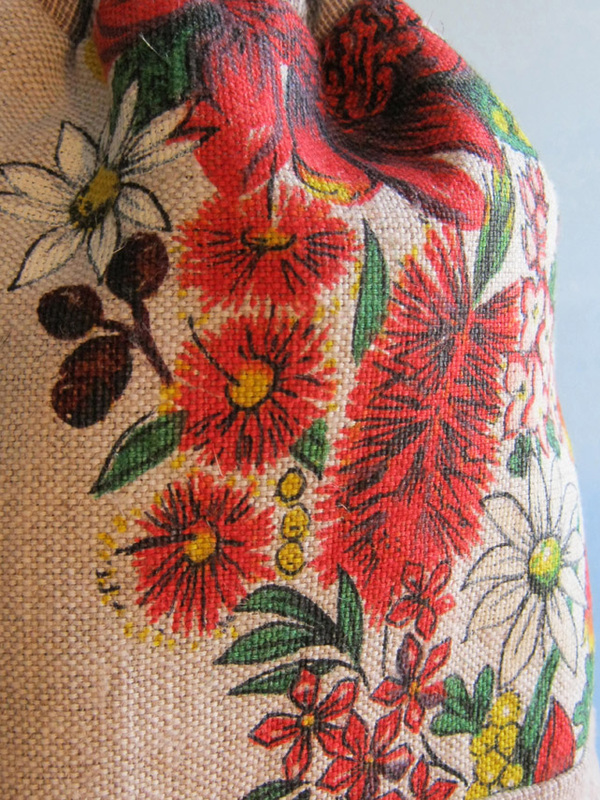 The raw edge of the lining is topstitched to make a contrast border. 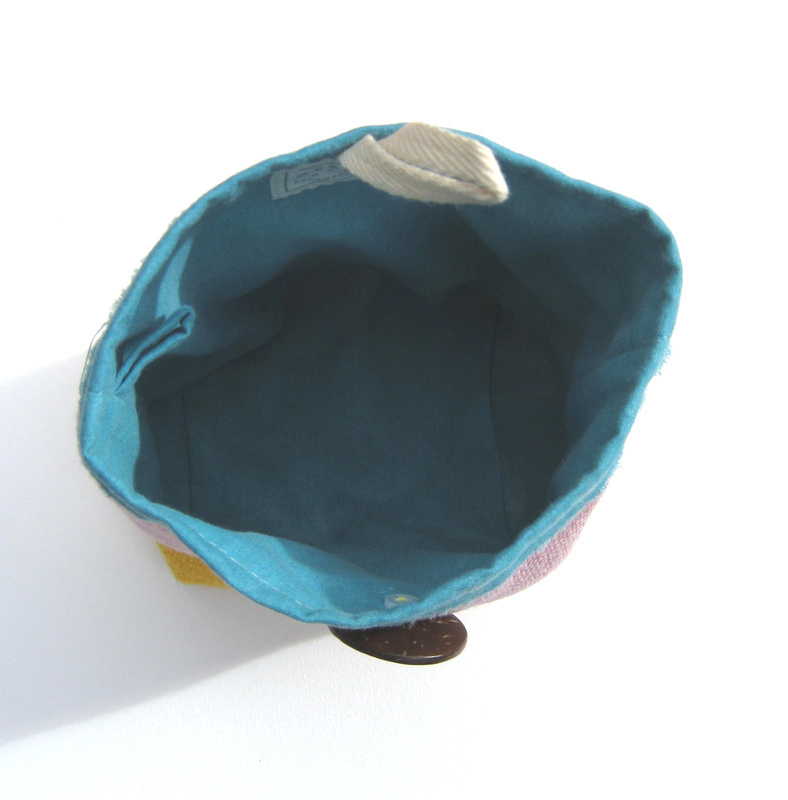 Inside there is a loop for your key ring; it also has a cotton interlining for soft structuring. 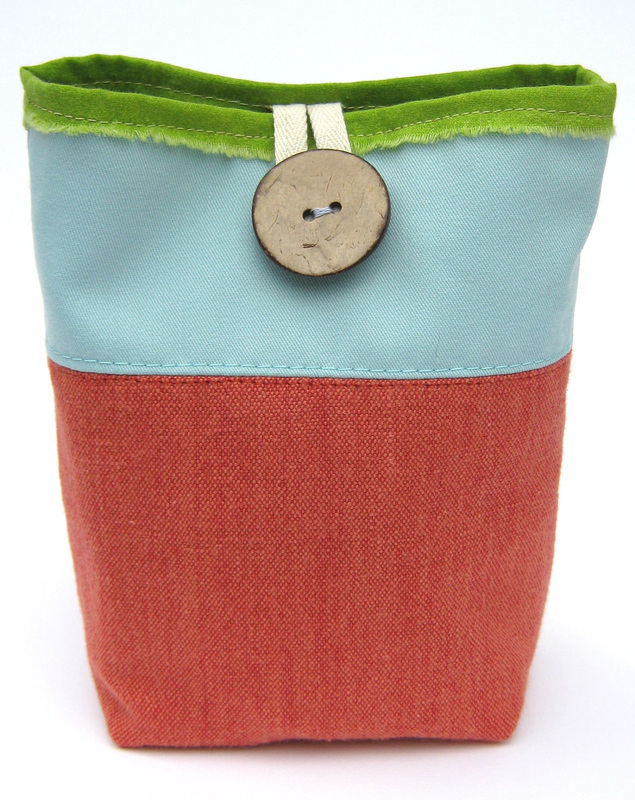 A contemporary art-inspired design with a focus on sustainability; a unique product & gift for those who want to reduce their ecological footprint without sacrificing style. 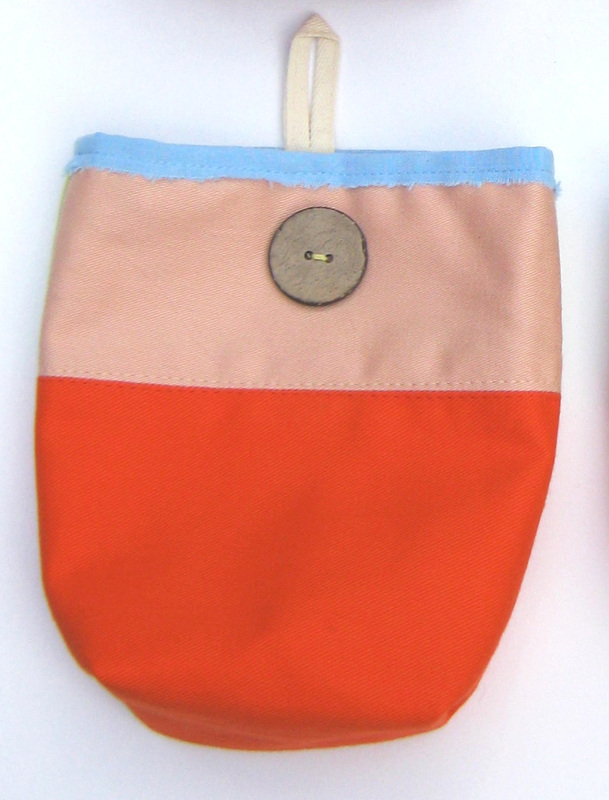 Vermillion orange cotton twill body with blush pink & pistachio green cotton twill contrast panels. 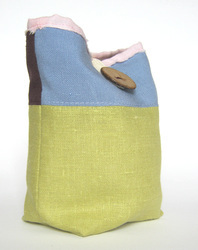 Lined with sky blue cotton. 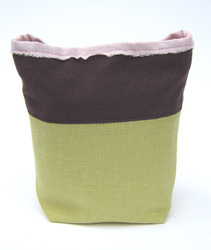 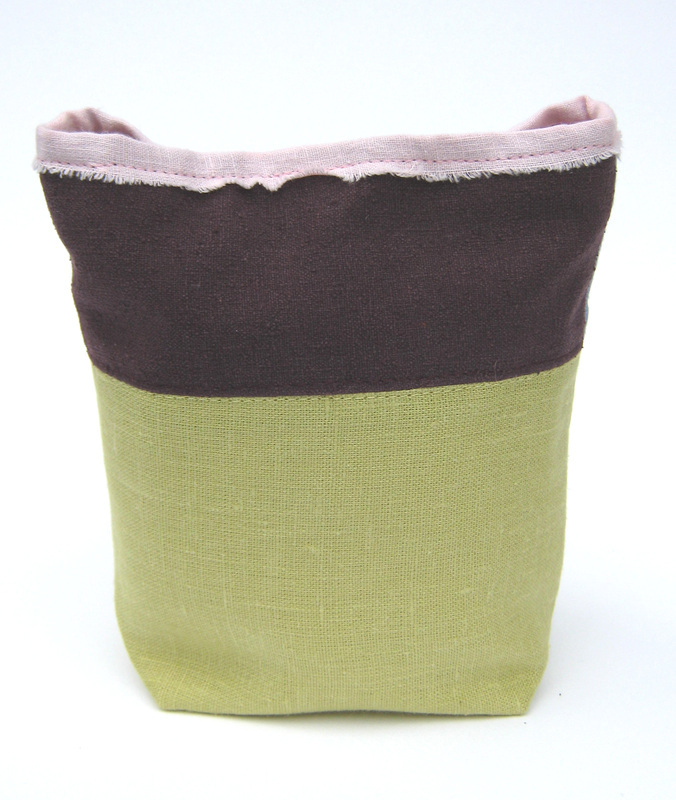 H 6 3/4" x W 6 3/4" x D 2 3/4"
Pistachio green linen body with pale blue vintage linen & aubergine silk panels. 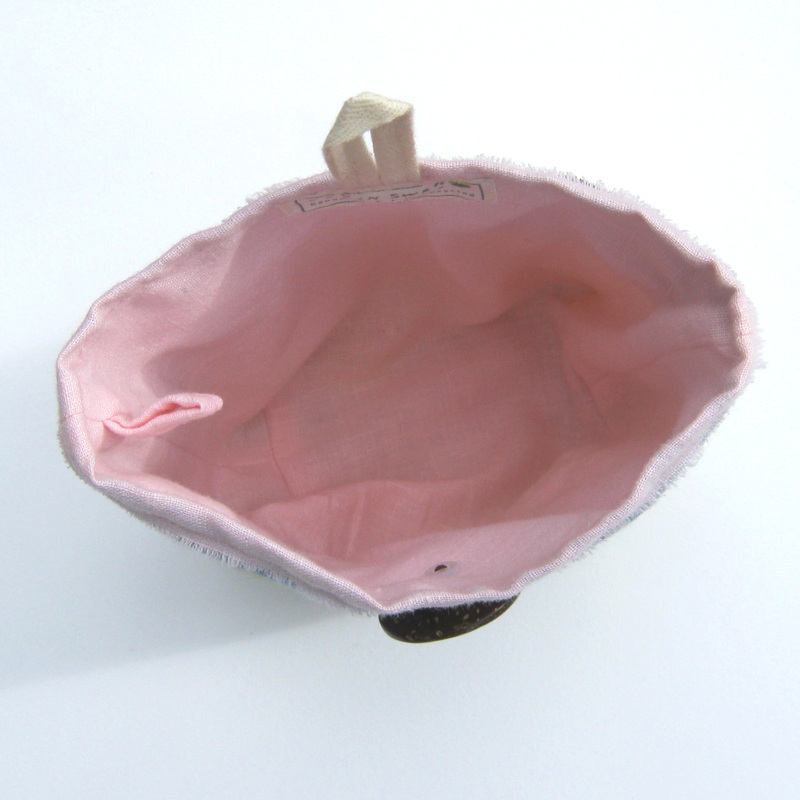 Lined with shell pink cotton. 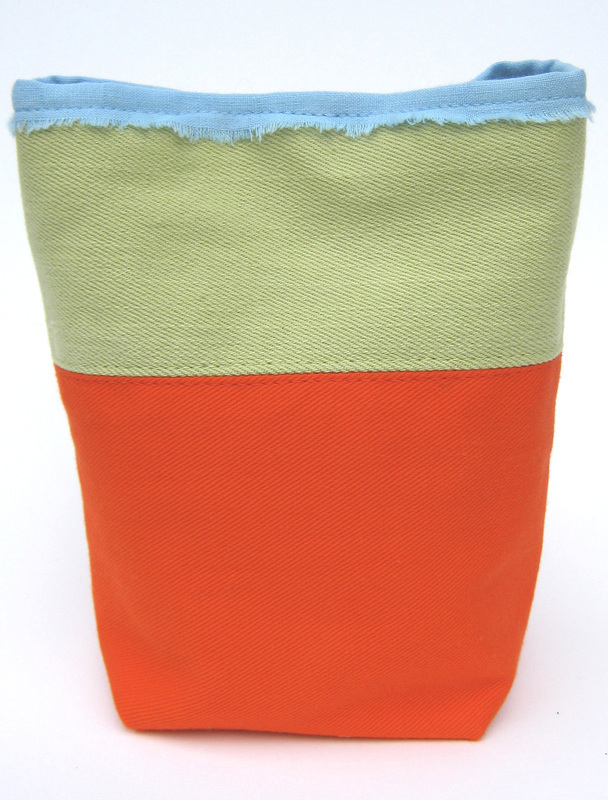 H 6 1/4" x W 6 1/4" x D 2 3/4"
Terracotta cotton body with soft turquoise & pale blue cotton panels. 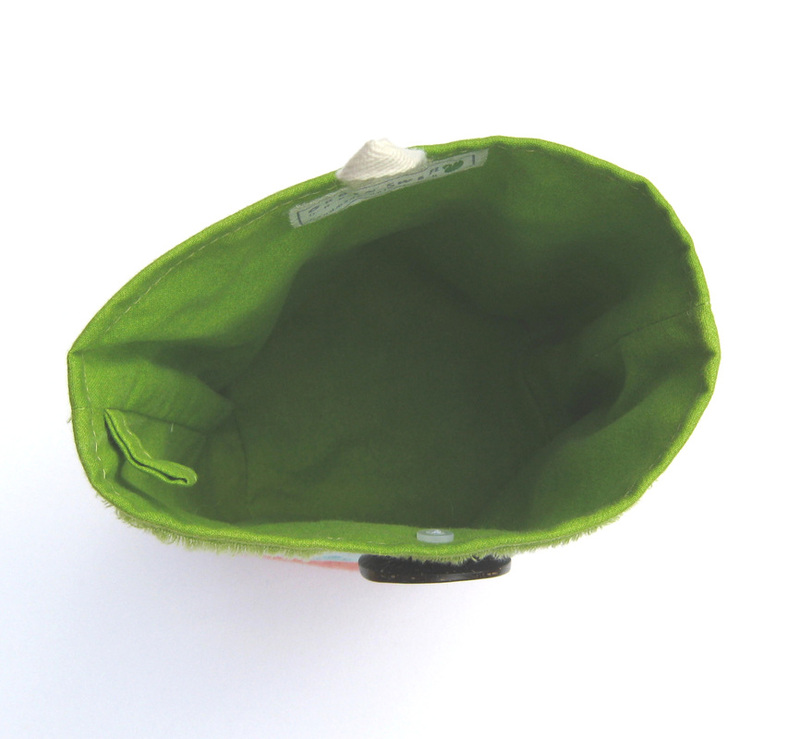 Lime green cotton lining. Golden yellow vintage barkcloth with dusky pink silk & primrose yellow barkcloth contrast panels. 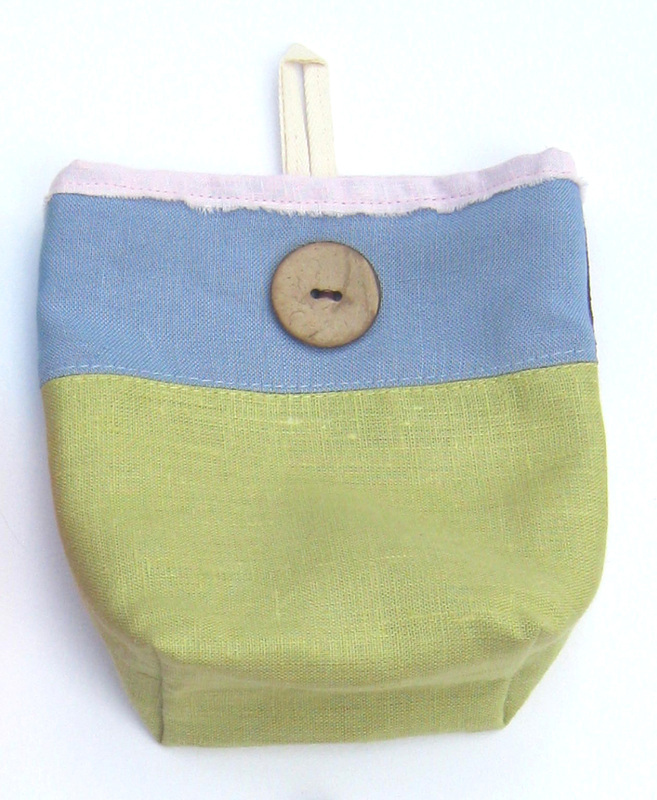 Lined with turquoise cotton. Handmade with care in west Cornwall.